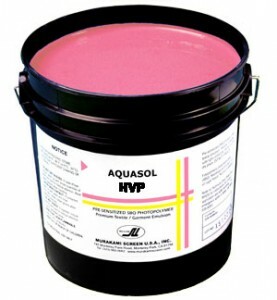 Murakami Aquasol HVP - RC Screen Shop & Supply Co.
Murakami Aquasol HVP is a high viscosity emulsion to create extremely durable stencils for all ink systems. SKU: MKS-AQHVP. Categories: Emulsions & Accessories, Murakami. Tags: murakami, pure photopolymer, emulsion. Murakami Aquasol HVP like Aquasol HV is a high viscosity emulsion to create extremely durable stencils for all ink systems. It has a more transparent quality that can help when registering by hand on press. Exposes fast and provides one of the most durable stencils possible for difficult inks like water base and discharge when combined with diazo additive and hardened with Murakami Hardeners.